Al Unser Jr.'s Turbo Racing is a racing game for the NES released internationally in 1990. 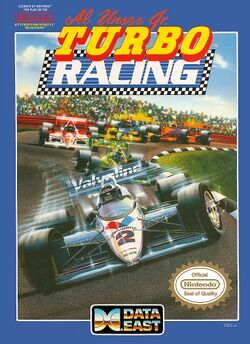 It is an adaption of the 1989 Japanese-exclusive Famicom game World Grand Prix - Pole to Finish (ワールドグランプリ ポールトゥフィニッシュ), with the most notable changes being the addition of Unser as an in-game coach, the number of laps, sound and interface design. This game features a season mode and two time trial modes. In season mode the player uses either Al Unser Jr. or they can make their own driver. Though it is a Formula One based game, Al Unser Jr. was a CART driver and never competed in F1. Versions released outside of North America were simply titled Turbo Racing with all references to Unser removed, due to the relative obscurity of CART and Unser outside of North America. This page was last edited on 15 August 2017, at 01:58.